I’ve always loved giving and receiving homemade gifts. It’s kind of my thing. I have even packaged up homemade peanut butter dog bones to give the family’s fur babies. 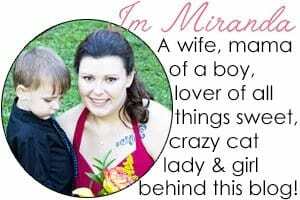 What I love most about homemade gifts is that they are personalized. Someone went out of their way and crafted something amazing for you! Being that I can’t get enough of baking, I find myself always giving away my extras as gifts. These fluffernutter muffins are no exception. As I write this post, they are being enjoyed by my husband’s co-workers. Homemade gifts are always the most cherished and remembered gifts. They can be very budget friendly too. For a project like this, Kraft has some of my favorite products. 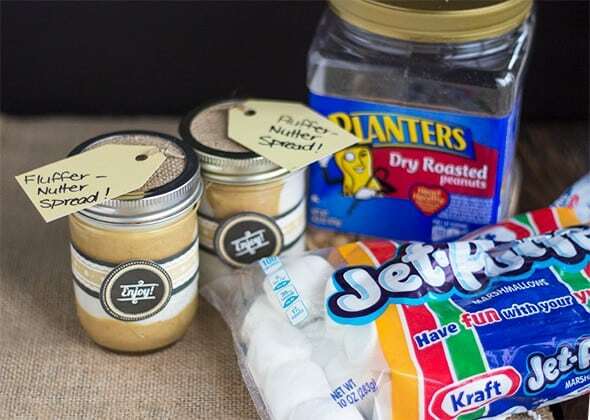 A large canister of Planters Dry Roasted peanuts and a couple bags of Jet Puffed marshmallows and you’ll have 4-5 pint jars of fluffernutter spread to hand out. It’s that easy. If you’re wondering how my peanuts became peanut butter for spread, just let me show you. Throw the dry roasted peanuts into a food processor and let it rip. Don’t worry, I’ll give you a bit more detail in the recipe down below. Next, let’s see how we put together that fluffernutter spread! I placed the marshmallows in a disposable piping bag and placed it in the microwave for 30 seconds. I then put the peanut butter in its own piping bag and piped layers of each into my jars. Throw a ribbon on this and you have the perfect gift! 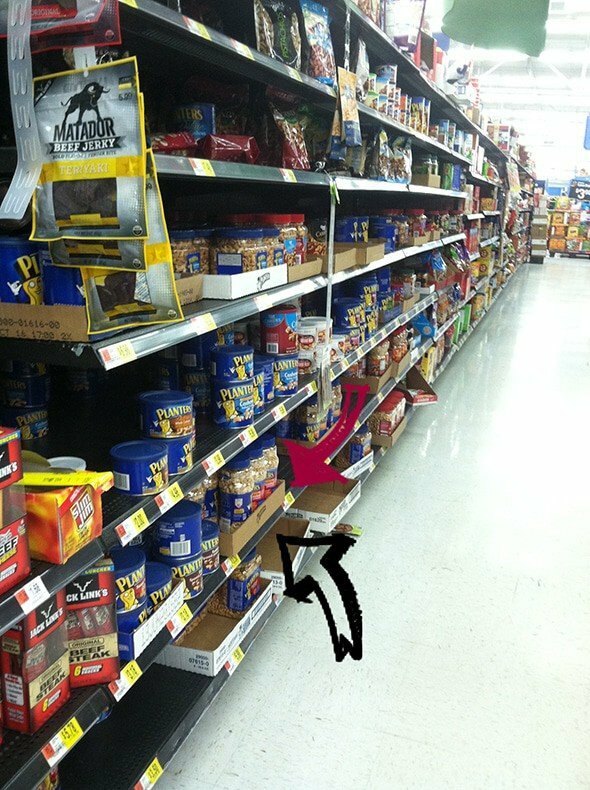 I got all my ingredients at my local Walmart. I like to grab my ingredients for the week’s recipes. What is your store of choice to pick of baking ingredients? 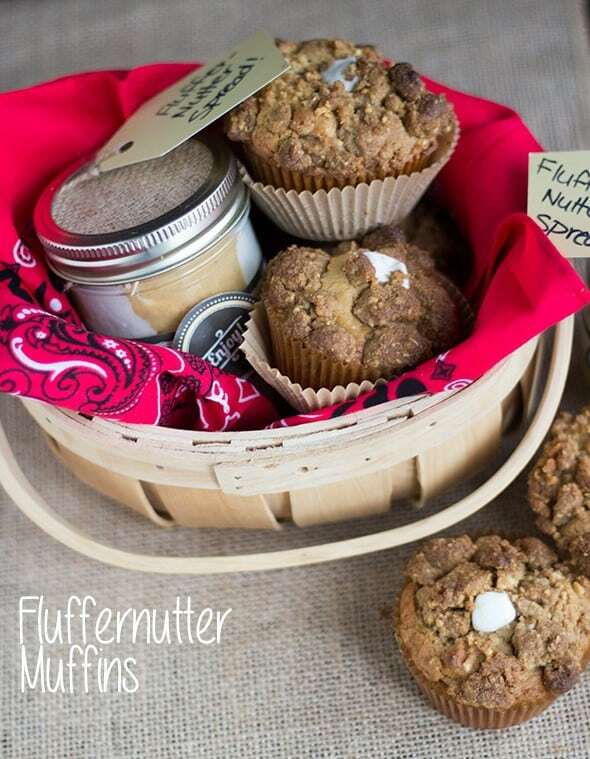 Now that we have our fluffernutter spread made, let’s get to the muffins. 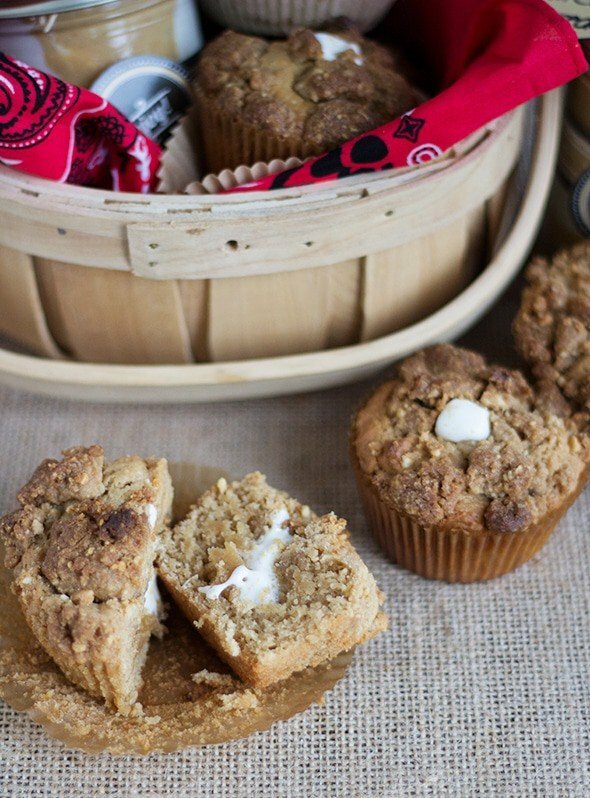 The thing I love most about muffins is that they are a one bowl recipe. You throw all the ingredients into a bowl and stir with a spatula. 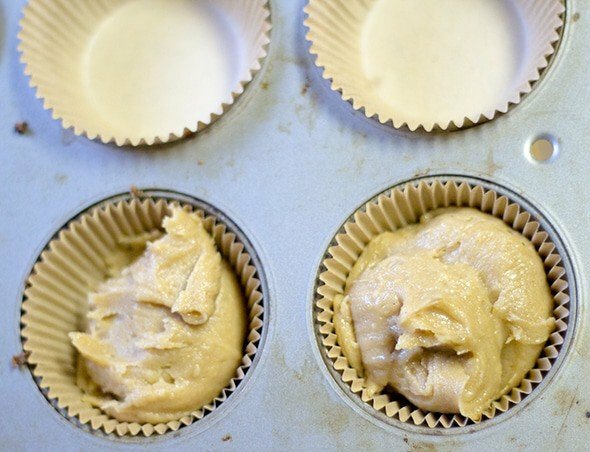 After you give it a good mix and everything is incorporated, place the batter into a cupcake tin prepared with baking liners. I added some peanut butter crumble that I had frozen the night before. Place them in the oven. You can find the times and temperature down below in the recipe. After they cool down for about 20 minutes, fill them with marshmallow filling. Place them in a linen lined basket and you have one of the best gifts that you could give. There’s nothing like a freshly baked muffin in some cute packaging. Everyone loves it. Everyone. Add 6 cups of Planters Dry Roasted peanuts into a food processor. Process on high for 1 minute. It will still be semi-chunky. Similar to the middle picture of the peanut butter process showed above. 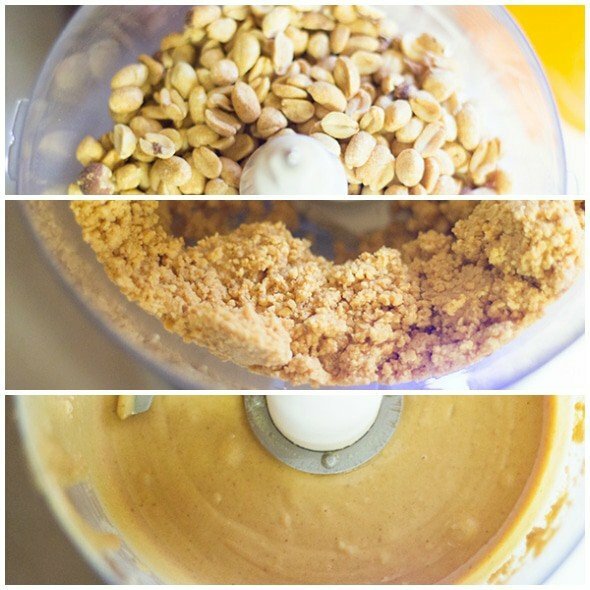 Remove 1/2 cup of the peanut mixture and set aside for the peanut butter crumb topping. Continue to process on high for 5-6 minutes until the peanut butter is smooth. There may still be a few small chunks. They won't hurt anything. Place in a bowl with a lid and refrigerate for 2 and half hours until the peanut butter is slightly firm. This will help the piping for the fluffernutter spread. In a large bowl, add in the butter, brown sugar, peanut butter, flour and the 1/2 cup of reserved peanut crumb topping. 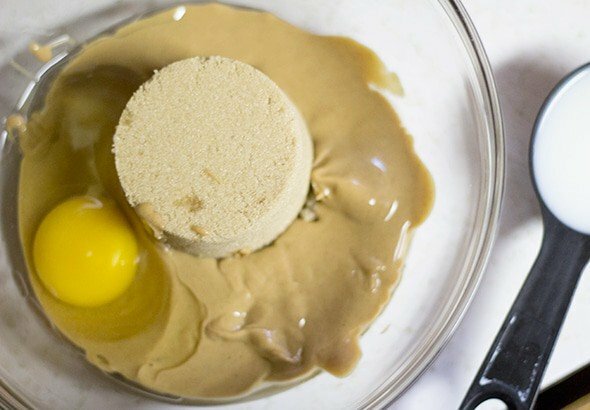 Use the peanut butter you just made. 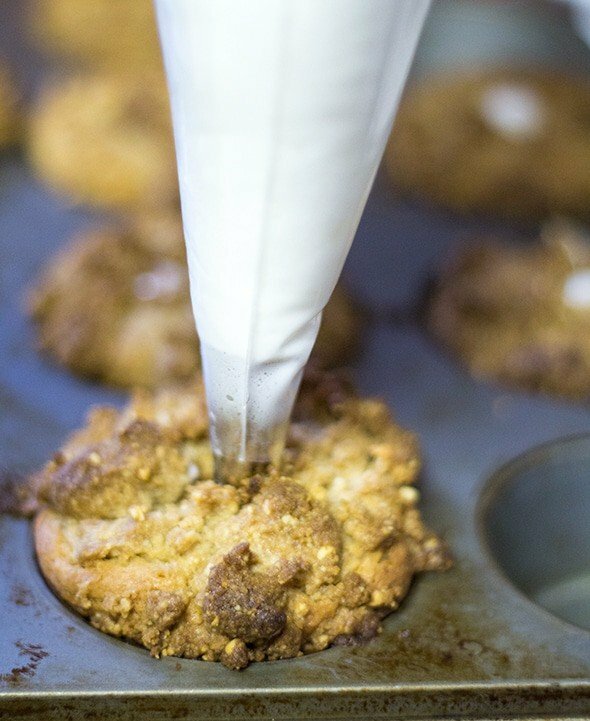 Using two forks or a pastry cutter, cut until it becomes moist crumbs. Place in the freezer for at least 5-6 hours. I left mine over night. 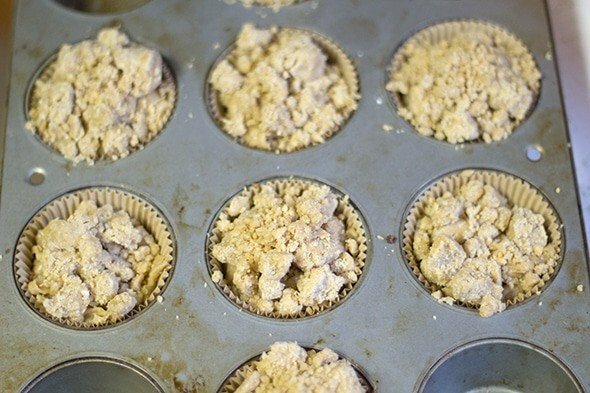 This will keep the crumbs in their crumb shape on top of the muffins. Preheat oven to 400 degrees. Line a cupcake sheet with baking liners. In a large bowl, add in vegetable oil, brown sugar, eggs, vanilla, milk, peanut butter, baking powder, salt, and flour. Mix with a spatula until thoroughly incorporated. Fill the cups 3/4th full of muffin batter. Add a layer of peanut butter crumb topping. Place in the 400 degree oven for 15 minutes. Reduce heat to 350 degrees without opening oven and let it bake another 9 - 11 minutes until done. Place a toothpick in the center of the muffin, if it comes out clean or with a few moist crumbs, they're are done. Let the muffins cool for about 20 minutes. Using a 230 tip, place it in a disposable piping bag. Fill the bag with marshmallows and microwave for 25 seconds. You can also use an apple corer instead of a 230 tip. Place 1 and 3/4th cups of marshmallows in a medium bowl. Heat in a microwave for 30 seconds. Place in a sandwich bag or disposable piping bag and fill the whole you made with the corer. 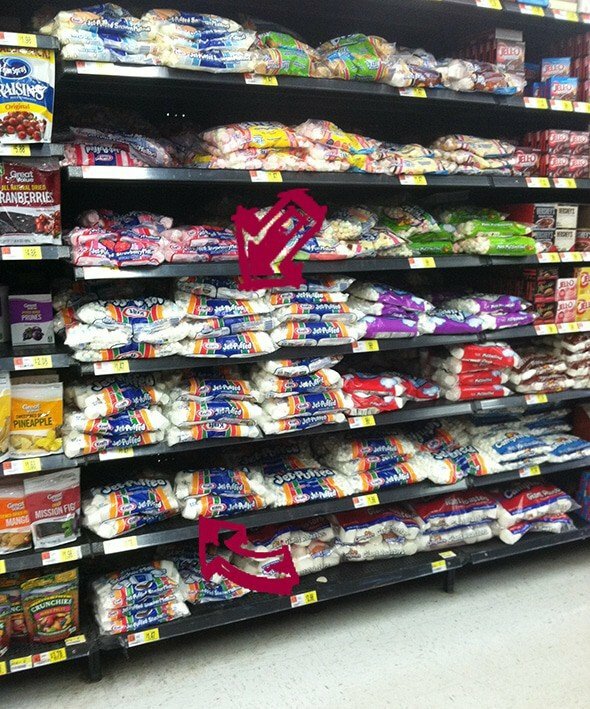 Place the marshmallows in a large bowl. Microwave for 30 seconds. Stir. If it still have lumps, microwave another 30 seconds. Place in a sandwich bag or disposable piping bag. Add the chilled peanut butter in another piping bag or sandwich bag. Start filling pint jars with the peanut butter. Fill about 1/2 an inch and then do the same with the marshmallow. Keep alternating until the pint jars are full. You should get 2-3 pint jars full. Decorate jars to your taste. I used burlap and some tags I bought at Walmart. 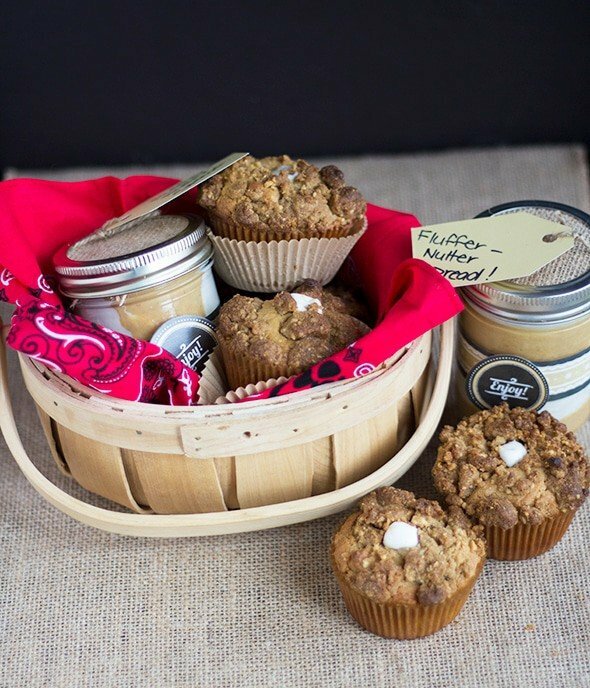 For more mouth-watering homemade gifts, check out the Cooking Up Good website. There are recipes, sweepstakes, loyalty programs, coupons and more! What’s not to love? If you’re looking for a new dinner idea or a chance to win some awesome prizes, be sure to check it out! What’s your most favorite homemade present that you’ve ever made or received? I would love to hear.